Helps your child to spell and recognize the different formation of letters according to where they come in the word. Consists of 40 blocks and a horizontal rod which can be assembled or unassembled, all stored in a wooden box with an illustrated base matching the blocks. Patterns are available presenting 3 different levels of exercises. These Arabic Letter Cubes are apart of our homeschooling morning routine for all my kids. I love the fact that it is so versatile and easy to use that they are all able to benefit from it regardless of their age! It is so much fun and engaging to play with, that I find myself fiddling with it at times. My youngest is in Kindergarten and has very limited exposure to Arabic reading/writing. 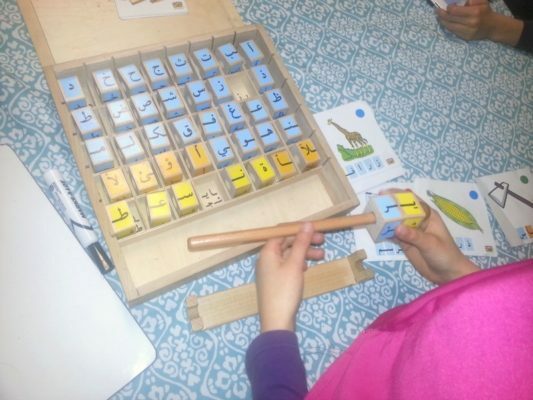 The Arabic Letter Cubes allow her to understand how Arabic letters change depending on its position of the word. Also, she is learning spelling and vocabulary all at the same time. The blocks come with flash cards which show her how the words are spelled with each letter broken down within its own cell, so that it is easy to differentiate what each letter looks like. I think this is a crucial step for beginners learning Arabic as it may be confusing for them to know when one letter ends and another begins as it is often connected together. It makes things a lot easier when I am teaching my daughter how to read, as we can work on sounding each letter (within its cell) separately before putting it together. My 2nd grader who is actually in 3rd grade (long story…) is also gaining a lot from it. He had limited Arabic instruction at his previous school (before we started homeschooling) so he is still struggling when it comes to reading. I completely understand as I too struggled to learn how to read Arabic, as it can be a daunting language to learn for non-native speakers! My other 3rd grader and 5th grader are much more proficient but growing up in America, they lack the constant exposure to Arabic. 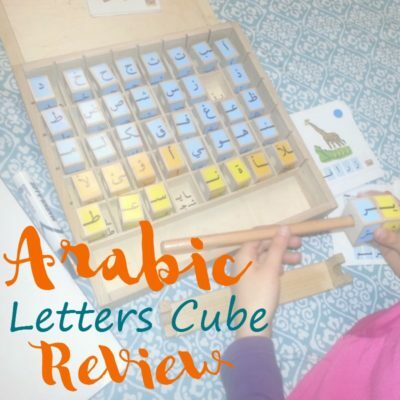 The Arabic Letter Cubes helps them to gain that extra exposure and build their vocabulary. After putting the words together, I have them write the words on a dry erase board with marker, so they can get more writing practice. Eventually, I will have to come up with my own flash cards, which should not be too hard. This is so that the kids can progress further after they have learned the set of cards the blocks come with. One thing I would have like to see with the Arabic Letter Cubes is the option to buy a set of more vocabulary words, and to have the tashkeel written for the words, perhaps in a different section so it would help non-native speakers with the pronunciation of the words. Overall, I am so happy with the purchase. The Arabic Letter Cubes are sturdy (very important for kids who are destructive like mine lol ), interactive, and fun! Are there any other Arabic resources that you can recommend? Thanks for sharing this review. My older two know their letters now but this would be wonderful for my 4 year old daughter! I wish I had had this back when my girls were little! Will share with my friends who have younger children. I know what you mean. I was actually looking for something like this several years ago when my oldest was still a toddler. But I found that even though my children are a bit older, they can still use these blocks and get some extra practice in. 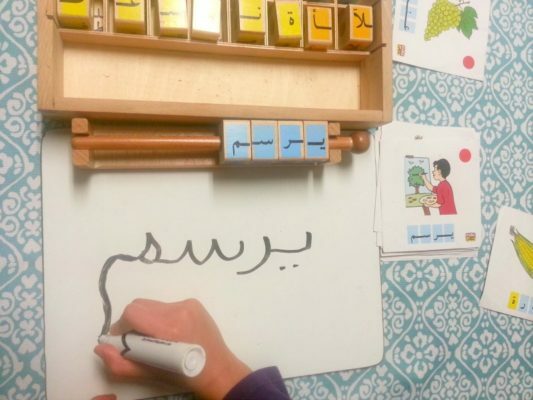 It still helps them with spelling arabic words, which they need more exposure to, growing up in the U.S. I think this is great hands on practice for children to learn to join Arabic letters. This is a great idea! It definitely is 🙂 It takes the boredom out of reading as they have something they can feel with their hands, and this helps with learning tremendously. Masha’Allah, the inventor is a genius. I have to it insha’Allah. JazakAllahu Khair 🙂 You might want to check if it is possible for them to deliver it to your area. I think Noor Arts offer international shipping. Looks like a creative and fun way to teach the kids. Thanks for the review! JazakAllahu Khair 🙂 It is really fun for the kids and a very sensory experience. The Arabic letters cube sound very interesting and helpful tool in teaching kids arabic spellings. I am glad i got to know about it frorom your blog. Jazakillah. Wa iyaaki 🙂 I hope you can benefit from it, inshaAllah. 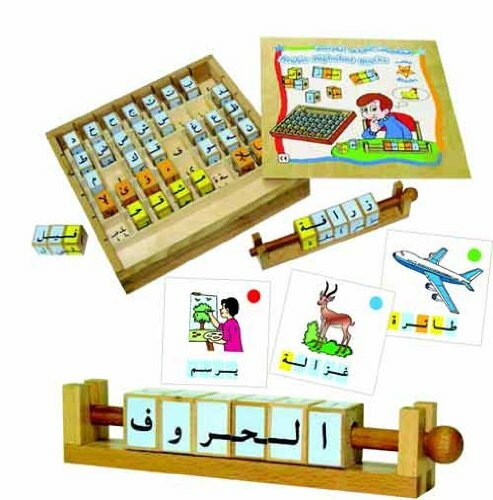 MashaAllah I think this product is great to engage children in the Arabic learning process through play and fun! I also like the fact that it is in wood and colorful. And yes, if it is used by non-native Arabic speakers (children and parents), it is important to consider that there are not the vowels (“harakat”) on the cards. Perhaps you can ask an Arabic-speaker around you to tell you the vowels and write it on the cards. And I like your idea of making your own cards! Thank you very much for this useful review! JazakAllahu Khair sister! It is really wonderful tool and very thoughtfully designed. I like the fact that it is made from wood, rather than the plastic that is prevalent these days in most toys. This looks like something useful to help teach the kids! JazakAllah , for such a wonderful learning tool. Masha Allah, this is so hands on ~ I love it when children are engaged using various senses especially with language learning. excellent review. I am looking for something like this for my 5 year old. I love this! Hand on manipulatives can really help cement learning. I think this would work well with all ages.